Among the various choices for your commercial or industrial building, flat roofs are a popular option due to their various assets. Counterbalancing these attributes, however, are some common problems typically developed by flat roofs—any of which will necessitate the services of a professional roofing contractor. If you find yourself in need of flat roof repair in the York, PA, area, you can count on the expert team at Capital Coating! We will attend to your flat roof and do the job right. Give us a call today at (717) 442-0979. Flat roofs have their inherent benefits, which make them popular among commercial building owners. For one thing, flat roofs are a comparatively inexpensive choice when contrasted with other commercial roofing options. Having a flat roof also provides an extra level of usable space atop your building where HVAC systems, storage facilities and more can be easily installed and accessed. Having a flat roof also makes it easier to perform maintenance, such as roofing work and gutter cleaning, and to install and service equipment such as satellite dishes and solar panels. Drainage issues: Flat roofs do not drain as efficiently as pitched roofs, and this can result in ponding water that eventually causes roofing materials to break down. 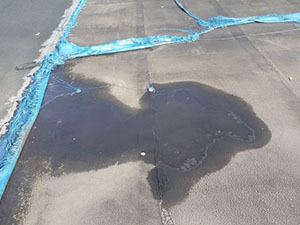 Problems with leaking: Flat roofs are prone to developing leaks, particularly along the roof seams. Stability concerns: Flat roofs, especially expansive ones that cover a large area, are known to have stability issues. In heavy snow and rain, a flat roof is more prone to buckling beneath the weight. Various other factors that can result in flat roof problems include storm damage, UV damage, impairment from weathering, loose membrane bonds, issues related to age, damage from straight-line wind, and problems resulting from building movement. Statistically, roofs are prematurely replaced as much as 70-80 percent of the time—an alarming statistic, indeed. 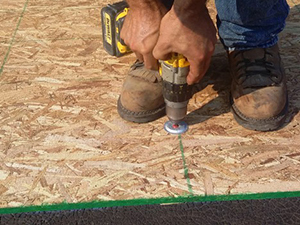 Prompt and properly performed repairs are the key to helping your roof last the number of years it was meant to last. If you have a flat commercial roof, you can count on the team at Capital Coating to keep it functioning well and for the long haul. Give us a call today at (717) 442-0979 for all of your roofing needs, including expert flat roof repair!